I have found a new use for hops, hop infused whisky, a whole new world! While mooching on the computer, surfing the net with an early morning cup of tea I stumbled upon Regula Ysewijn’s food blog Miss Food wise. A stunningly visual blog, I was admiring her wonderful photography and enticing recipes, well I was smitten to be honest, as I am always a sucker for a good recipe book. Then I saw her blog post about making a hop brandy and knew I would have to give it a go. 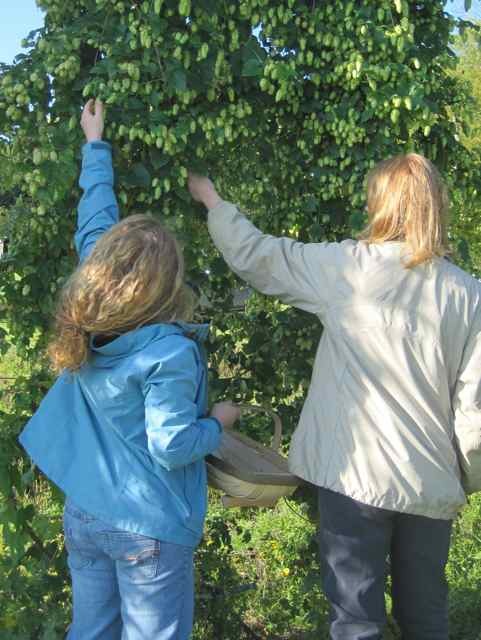 With hop picking imminent the timing could not have been more perfect. At our local stores Famous Grouse whisky was on Special Offer so I bought this instead of brandy which Regula had used. It made sense for this first trial run. the only decision now was which of the Bushel of Hop’s hop varieties would I use for this first attempt. 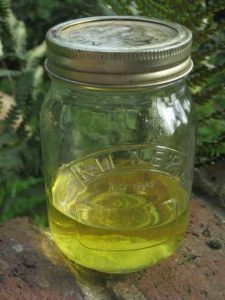 Put all ingredients into a Kilner jar and stir gentle twice a day. I left it for only 2 days before straining the hops off. I did not squeeze the hops but left them to drain off completely overnight in a covered vessel. I was intending to add the hops back again should the flavour be too weak, but it was fine. The taste…mmmm…..well it is more the timing of the tastes. Definitely whisky, the whisky is first with the sweetness like a hot toddy, it takes the heat out of the whisky but you also know something is different. 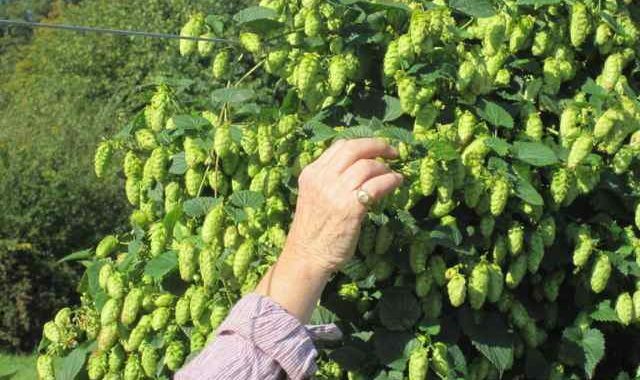 It is then that the hoppy flavour comes through. It is a pleasant hint of bitterness, rather like a good cheese straw with that pinch of cayenne – good but it leaves you feeling you would like to have another just to make sure it really was that good! Overall it was a teensy bit too sweet for my taste, but that is just a personal thing, it really is quite acceptable. However next time I will be bolder and try this whisky infusion with 1 oz sugar, I could always add it later if necessary. However I am delighted with this first attempt. 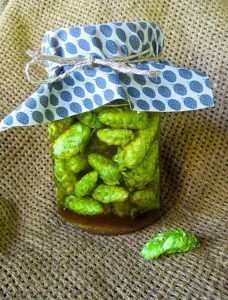 Whilst I rather liked the fresh hops, I think I will be tempted to try it with dried hops this winter just to see the difference. Over this winter I can try the hop infused whisky in different ways. A whisky sour, or mixed with a dry ginger ale. Easiest of all a Hop Scotch, simple, with the sugar already in the infusion, no honey needed just add water! I found the ‘Hop Scotch’ from Chilled Magazine. Encouraged by this whisky success there was 1/4 bottle gin in the cupboard much too tempting to be left here just begging to be used. 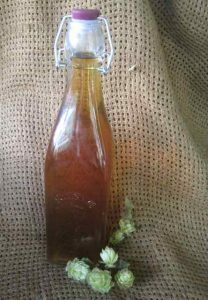 I popped this iam jar with 2 teaspoons white sugar and eyed up an an equivalent amount of fresh Cascade hops as I used for the whisky. This time I left it for only 1 day then strained the gin off the hops. The resulting gin is now a beautiful pale Chartreus green. So again I need to try it out in different ways although this time there is not so much gin to play with. Perhaps add some citrus as recommended by Beercade’s “Hop Gun,” from Chicago. Whisky traditionally makes a perfect digestif. Oh dear these ‘hoppy’ cocktails are a whole new world! Talking of meal endings if you’re a traditional British pudding addict, Regula has just bought out a book called Pride and Pudding. As winter bites at least we have the excuse that a pudding will help keep out the cold! !